To make a difference? Well, there's something in it for everyone! The Trust is a voluntary organisation. It is entirely volunteer led with our General Manager and Education Programme Manager being the only paid members of staff. Everyone else donates their time without charge. Our volunteers take part in a great range of activities, some only one and others several. But we all get the same great feeling of doing something worthwhile. Whatever your interest, there’s something at Batchworth for you to do, and enjoy doing, for the benefit of all the residents of the area. We've identified a range of roles, some short term, some lasting a few weeks, and some going on indefinitely. Some are flexible, so that you can take part when you can. Our list of volunteering opportunities is here. It’s unlikely to be absolutely up to date, but you can see the sort of thing we do. We run our award winning education programme 'Learning at the Lock' aimed (at present) at primary school children but we hope to expand this to other age groups once our new eduction centre is built. We run a shop and information centre at Batchworth open throughout the year. We train boat crews and captains in driving "community boats" like ours, and award nationally recognised qualifications. 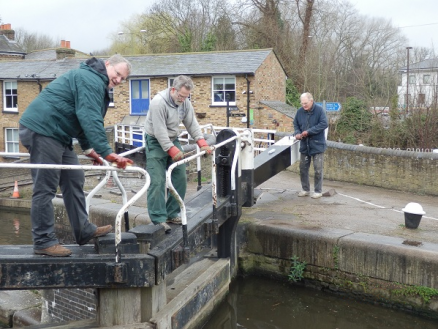 We look after the area between Batchworth and Stockers Lock under an adoption agreement with the Canal and River Trust. We own, look after and care for our historic narrowboat 'Roger' built in 1936. We run the award winning Rickmansworth Festival during the 3rd weekend of May each year. Our work gives real opportunities to gain experience of a wide range of skills. We can find a role for people with a wide range of interests and capabilities. We encourage our volunteers to be "in charge" of the activities in which they take part. And most of all, we know that this will be both different and fun! Interested? Want to know more? Come and give it a try. The rewards are clear.